A beginner keyboard is a great way to introduce piano playing to children without risking a large investment into a full-size piano (which may not get used). The best beginner keyboards provide an authentic playing experience and should allow your child to develop their playing skills while, hopefully, sparking a musical passion. It’s important not to view keyboards as toys. Picking a random cheap keyboard will likely result in you owning a large piece of plastic junk! It won’t last long, plus they keys will be so flimsy they won’t provide a realistic playing experience; not good for learning. The RockJam is a competitively priced, great all-rounder with a solid build and surprisingly good sound quality. It also comes with an extensive array of inbuilt e-learning tools and all the accessories you’ll need to get going. Avoid overly complicated keyboards with tons of functions. They tend to distract children from the actual musical side of keyboard playing – not to speak of driving you up the wall as they test out 200 crappy sounding demo songs! It can also be a turn off if they need to ask for help constantly because they can’t figure out how to even turn the thing on. Having some proper and decent functionality like touch-sensitivity, a metronome, a selection of quality “voices” (eg, strings, brass, woodwind), nice reverb, and some good drum sounds, will be enough to keep your kiddo engaged. In short, you are looking for a keyboard with a limited set of usable and useful functions; neither too many or too few. Sound quality plays a huge role in any instrument, real or electronic. A rich and beautiful sound will immerse your kids, motivating and inspiring them to play more. On the contrary, a low-quality sound, “cheap” sound will demotivate your kids and they may lose interest. Ideally, the instrument sounds from the keyboard should be as close as possible to the real acoustic instruments that are being imitated. Of course, no keyboard can reproduce the sound of the original instrument 100%, but some do a much better job than others. In our reviews, we’ve chosen keyboards that where the sounds closely simulate the original instruments. Some keyboards come with easy-to-follow and built-in lessons. These are often accompanied by method books. The benefit here is that you can learn to play keyboard together without a teacher during the beginning stages. 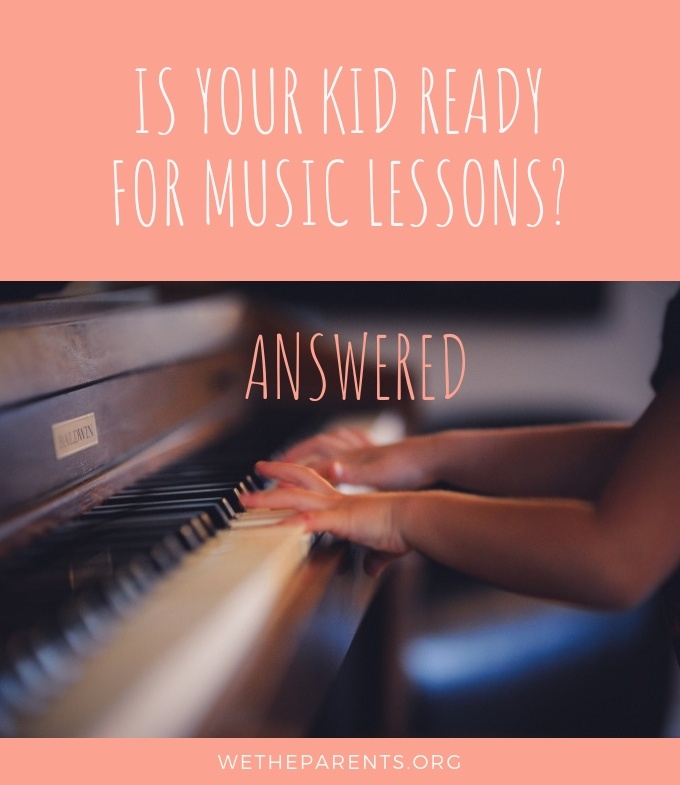 Once your kid has built up some confidence, then they will be ready for a piano teacher. Number of keys – Most keyboards are either 44-key, 54-key, 61-key, or 76-key. The number of keys isn’t really important in the beginning stage since the beginner songs aren’t hard enough to use a wide range of keys. 61-key keyboard is plenty and your kids can play a thousand songs with it. Touch sensitivity – This means that the harder you press the key, the louder the sound emitted. Touch sensitivity is a MUST HAVE feature in a keyboard if you’re really serious about learning music. That said, younger kids’ fingers aren’t strong and so touch sensitivity doesn’t play as an important role for them. Total weight – Keyboards are relatively light (for adults anyway), and so moving them won’t be a huge problem. You can easily pack it up and place it anywhere you want since it just takes a small space. Bench/stool, stand, and chair – You need to pay attention to these things because some retailers sell them separately. The stand and bench allow you to adjust the height of the keyboard or your seat. This is important and ensures your kids have a right posture when practicing. Integration with other devices – If you want your kids to perform on a stage or learn with computer or smartphone apps, then pay attention to these features. Adapter, battery power – Almost every keyboard has the US-standard 110-120 volt adapter power. Some have battery slots for keyboard-only usage. However, just use the power adapter is enough. Number of tones (instrument sounds) and beats (rhythms) – Counterintuitively, less is best. Since your goal is to generate musical interest in your kids, too many tones and beats just distract your kid from practicing. The main thing is that the piano tone is as true as possible. Number of demo songs – Ignore. Totally useless! Recording and playback function – Not very important. It is seldom if ever used by children. Now we’ve covered the major and minor points of consideration, let’s dive into the reviews. Accessories included: Stand, Stool, Headphones, Power adapter. The RockJam 61-Key is our top pick. It has a decent array of useful functions, good sound quality, great built-in lessons, and comes with all the accessories you need. It provides all of this a competitive price. It’s definitely a solid choice for any family. This keyboard has some great integration tablet app such as Joytune and Piano Maestro. You also get 2-months free face to face lesson by Take Lesson and 3-months free membership of Skoove. Both are great services which can help to get your kid off to a headstart with their playing. The Yamaha YPG-235 is the king of beginner keyboards. In fact, the term “beginner” can only be used loosely here because this high-quality keyboard will comfortably accompany your them until they are advanced pianists. The sounds on YPG-235 are beautiful and realistic, creating an immersive playing experience. Also, the keys are weighted and touch sensitive which means playing this keyboard is very similar to playing a real piano. Of course, this quality comes with a bigger price tag. Well worth it if you can stretch your budget. The built-in lessons are Yamaha Education Suite (Y.E.S.) which is known for its sophisticated pedagogy. The Casio SA46 is a great choice for young child (4 and under). It’s light and compact design make it easy to transport or pack away. And, while it’s the cheapest keyboard under review, it does come bundled with learning materials including learning book and stickers for the keys. All this makes it well worth it for younger beginners. Naturally, the playing mechanism and sound quality are not as close to the real thing as other keyboards, but, that said, it’s certainly good enough to introduce your kiddo to basic principles of keys. 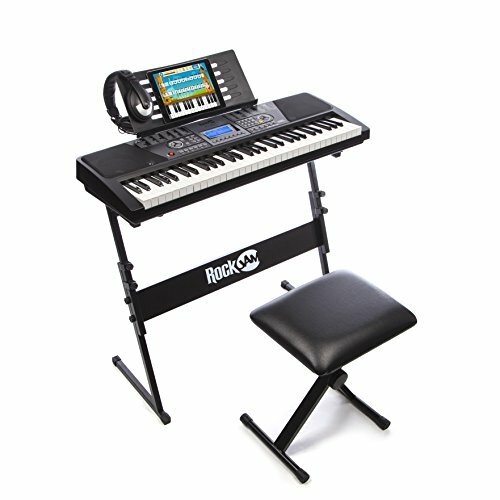 The Casio CTK2550 is a solid sounding keyboard that ships with a stand, power adaptor, and pair of HP30 closed-back headphones. Due to its popularity with parents, we felt we’d include, however, personally, we don’t think it’s as good as the RockJam 61-Key keyboard. They are comparable in terms of build and sound quality but the CTK2550 has a higher price tag but provides less effective learning materials. One stand out feature is the built-in microphone and record and playback; worth considering if your kid loves to sing and may want to try their hand at singer-songwriting. The Alesis Melody is a decent semi-weighted keyboard for beginners. The weighting means that the keys feel closer to the real thing which makes transitioning to a piano easier. It comes with an easy-to-assemble stand and stool, headphones, and a microphone. It’s a fun all-rounder but watch out: the volume is loud and so you may regret it if your little one loves the sound of their own voice amplified! The microphone! It isn’t bad but your kids will probably use it to hear their screaming through amplified speaker! The RockJam 61-Key Electronic Keyboard is our favorite beginners’ keyboard. Unlike others, it comes with all the accessories you need, plus some great inbuilt music tutorial features. All this means that for your money, you’re kiddo have everything they need to get going. It is also durable and comes with advanced featured, so it will easily last them until they are proficient players ready for a real piano. The RockJam is a competitively priced, great all-rounder with solid build and sound quality. It also comes with an extensive array of inbuilt e-learning possibilities and all the accessories you’ll need to get going. Right, let’s assume you’ve bought the right keyboard and got it set up. Now the real fun, and challenge, begin. Should you seek out a teacher immediately or simply help your kids to learn themselves at home? Nowadays, the inbuilt music lessons that come with keyboards are pretty sophisticated. They are often enough for you and your kids to learn the basics of music theory and playing techniques. Then, when you hire a teacher, your kids will be ready to hit the ground running and will improve much faster. Where to start when learning at home with your child? First thing first, have fun. Let your kiddo fool around and enjoy learning how the keyboard works. The fastest way to turn your child OFF learning any musical instrument is to go in heavy and apply pressure from the get-go. Instead, wait until they have familiarized themselves with how to switch it on and make a noise. 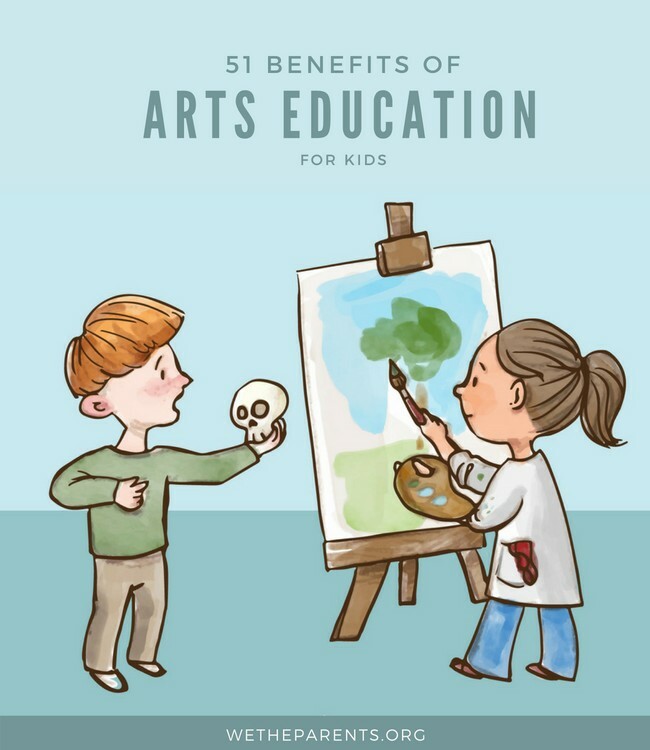 Once, they’ve had some self-directed fun, then you can gently move on to your first lesson. Step one is to introduce the pitch names of musical notes. This will allow them to read sheet music and play the corresponding notes on their new keyboard. That should get you and your kiddo off and running. That’s it for my guide on the best beginner keyboard for your kids. If you have a question about anything from this guide, feel free to comment and I will answer you ASAP. Sure, we’re very pleased you found it valuable. We hope your kiddo goes far on the ivory keys! Very useful post. Instead of really buying cheaper price keyboard that you don’t know how long will serve you, it’s better to buy one which will do all the correct work but at reasonable price. It not always the price that matter but the quality and how usable it is to your child. Hey Julia. We agree. Cheap keyboard are always best avoided, unless you are buying for a very young child (2 or 3) in which case it is more like a toy which stimulates their interest and familiarity with the concept of keys producing tones.